LINKS IN THIS POST MAY BE AFFILLIATE LINKS, WHICH MEANS I MAY EARN A COMMISSION IF YOU MAKE A PURCHASE FROM ANY OF THEM. YOU CAN READ MY FULL DISCLAIMER HERE. Sweet potato pancakes anyone? These buttery, fluffy sweet potato pancakes are the answer to your pancake fix, your sweet potato fix…pretty much any fix you need honestly. Breakfast is my favorite meal of the day. And on the weekend we normally do a BIG breakfast. Sweet potatoes are my favorite vegetable. And I have made a way to give you vegetable infused pancakes in a fluffy stack of yum. You can thank me later for helping you work those vegetables into every meal…lol! Sweet potato biscuits, sweet potato hash, sweet potato fries. I think it is fair to say I have not met a sweet potato that I have not fallen in love with. 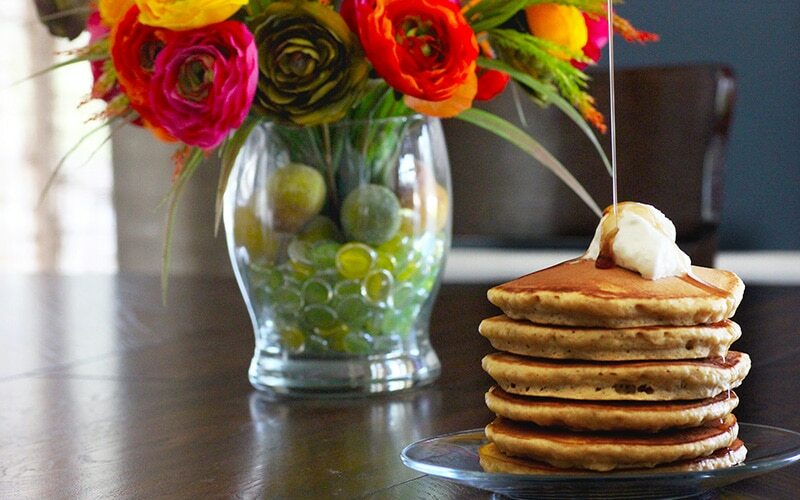 And these sweet potato pancakes are not the exception. This is probably one of my favorite pancake recipes. They are buttery, fluffy, sweet potato-ey. They are amazing! One of my favorite things that I look forward to on the weekend is waking up and making breakfast. The only thing I love more than that is actually waking up to a big breakfast. One that is already made. Until I came up with these pancakes, hubby was probably the head pancake maker in the house. And I didn't mean to do it. But I even outdid myself on these. Move over baby there is a new head pancake honcho in this house. I love putting together a good filling breakfast, which normally translates into brunch in my house. I don't like to rush, and really good food shouldn't be rushed, amirite? These sweet potato pancakes are not too sweet and with all the buttery goodness and flavor your heart could desire. They can be made with things you probably already have around the house. 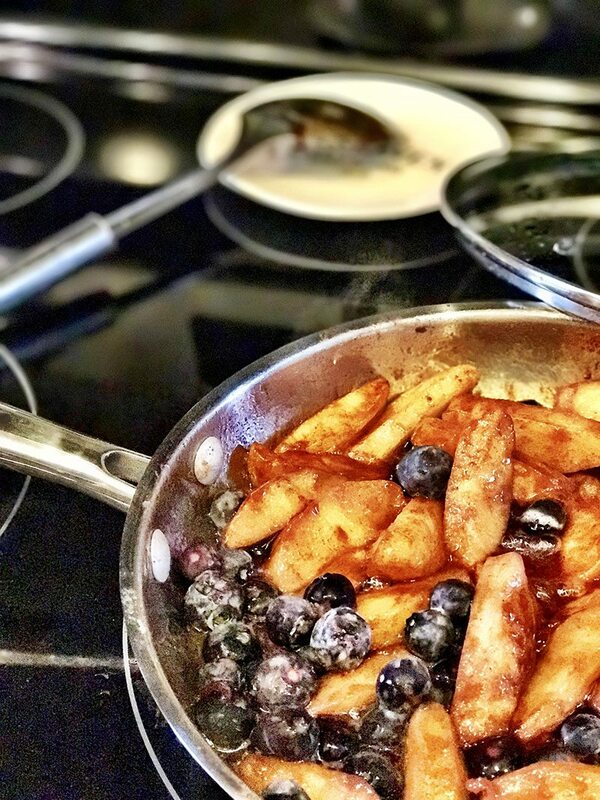 Sometimes, I choose to top them with some fried apples and blueberries, but they are equally amazing topped with some maple syrup and butter. The good kind! 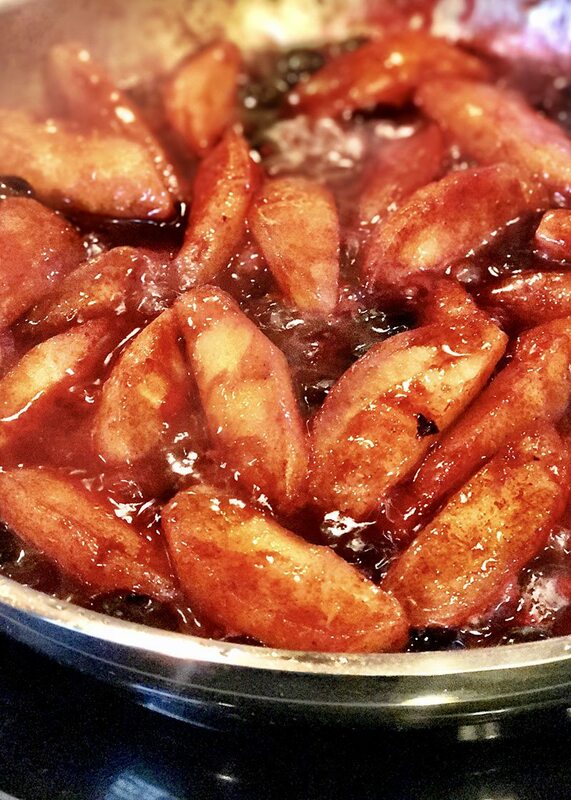 You start by adding brown sugar to your boiled, soft potatoes and mash it together. 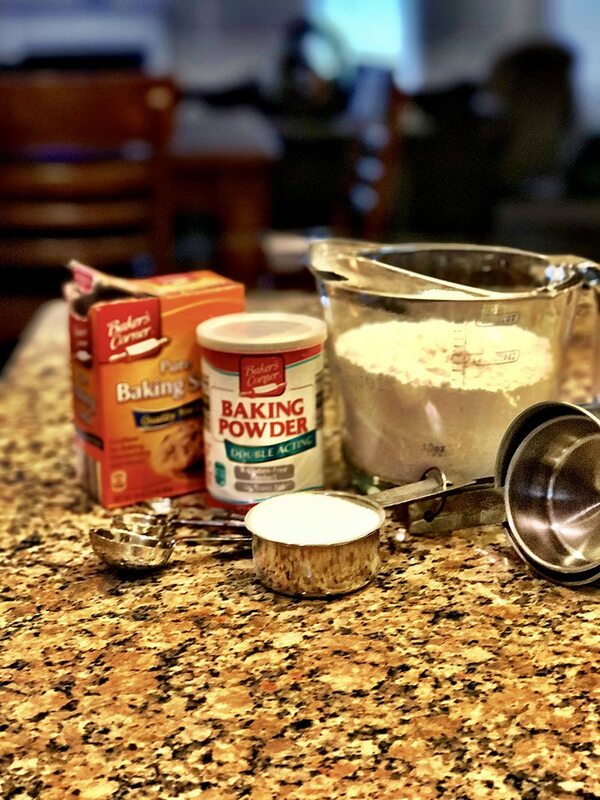 Set that aside and whisk together the dry ingredients – the flour, sugar, baking powder, baking soda, salt. Add the mashed sweet potato mixture into the dry ingredients, and separate your egg yolk and white. I like to add the yolk in with the milk before adding that to the other ingredients. Setting the egg white aside for a minute. Blend all ingredients together, and then add the egg white in last, blending for an additional minute or so. Heat a nonstick skillet or pancake griddle and butter it with unsalted butter. You can use non-stick spray if you would like. I personally love the buttery flavor the butter gives the pancakes. 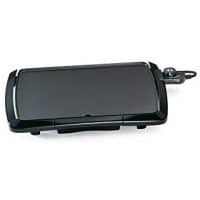 Pour the batter onto the hot griddle about 1/4 cup at a time, for medium pancakes, or 1/2 cup for larger pancakes. I do it both ways depending on how I am feeling at the time. And that's it folks… serve up all the yum and enjoy! 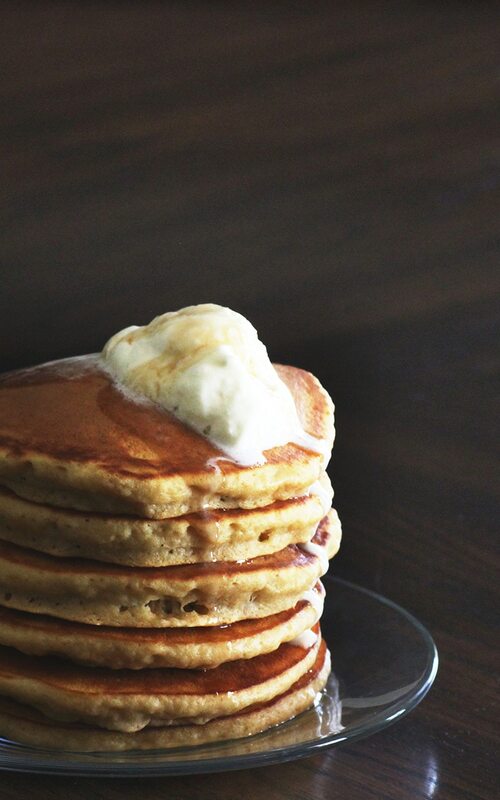 Fluffy sweet potato pancakes that taste amazing. Serve with maple syrup or fruit on top. Cut into pieces and boil until soft. Add brown sugar and mash together. Whisk together flour, sugar, baking powder, baking soda, salt. Set aside. Add mashed sweet potato to dry ingredients. Separate egg white from egg yolk. Mix yolk with milk and add in with other ingredients. 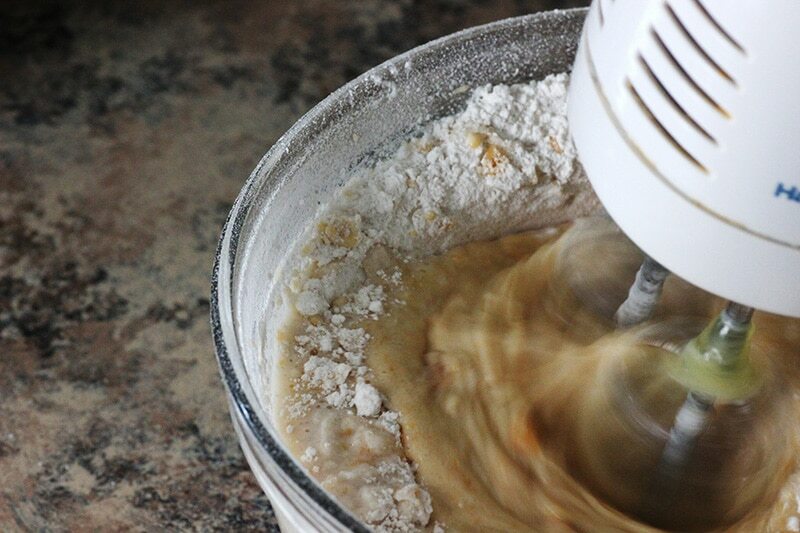 Mix together using hand mixer or spoon for 2-3 minutes. Add in egg white, and mix for additional minute or so. Heat a nonstick skillet or pancake griddle and butter it with unsalted better. 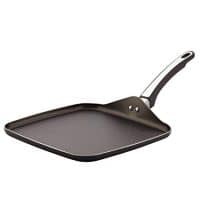 Pour the batter onto the hot griddle using either 1/4 or 1/2 cup depending on desired size. When the top of each pancake begins bubble, flip and continue cooking on the second side for additional minute or so. Remove and repeat until all batter is used. 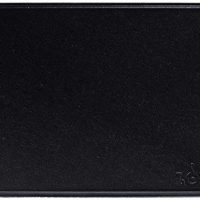 As an Amazon Associate and member of other affiliate programs, I earn a comission from qualifying purchases. Editors note: This post was originally posted on May 5, 2017. 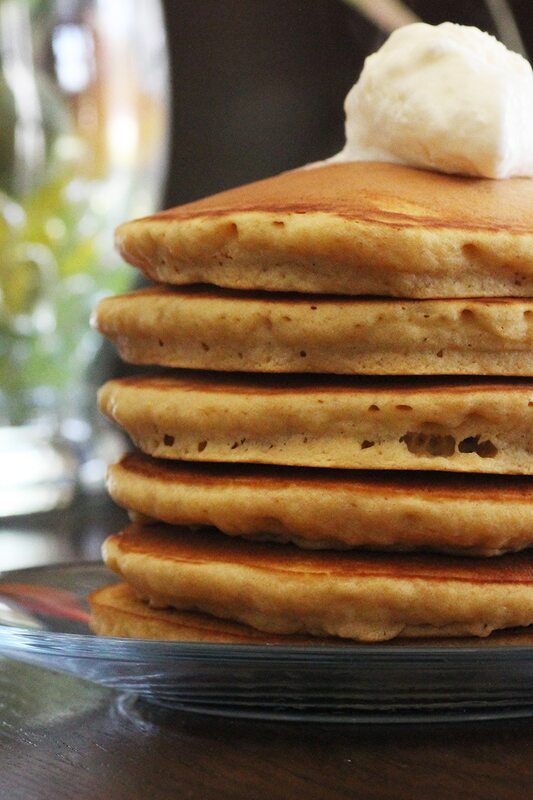 INTERESTED IN MAKING FLUFFY SWEET POTATO PANCAKES? YOU CAN PIN IT AND SAVE IT FOR LATER WHEN YOU ARE READY TO MAKE IT! Questions, Comments or Just Want to Say Hey ??????? ?, Drop Me a Line in the Comments. My family and I always try to have big family breakfasts on Saturday and Sunday mornings. This looks awesome! I am glad you posted these! I remember you telling me about them when I posted Banana Pancakes! These look delish!! I’m gonna make those banana pancakes!! I just re pinned them to remind me too! I LOVE sweet potato pancakes! I bake sweet potatoes in batches and purée it then keep it in the fridge for a week or so to use in pancakes, muffins, and oatmeal over several days. My family would love these! I’m not a pancake person, but I do love sweet potatoes any way I can get them. So making this on a lazy Saturday morning sounds like a perfect way to start the weekend. Oh my gosh… my son will LOVE these. And those apples & blueberries on top?! That looks to die for. Those pancakes look wonderful. I find myself checking out your blog almost everyday just for your tasty recipes. Thanks for this one as it will be utilized. I feel the same way– I’ve never met a sweet potato that I didn’t like! 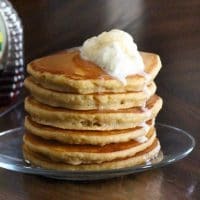 Sweet potato pancakes are one of my breakfast weaknesses, if I see them on a menu at a restaurant I just have to order them! I’m going to try making them at home now! Oh my, that apple and blueberry topping looks delicious!! I’ve never tried sweet potato pancakes, but I would LOVE to. I’m sure they would be a great change from my regular banana oat pancakes so thanks for sharing! These look sooo yummy! Definitely going to pin for later. Thanks for sharing this. I’ve been looking for a lot of low carb meals lately. Notify me of replies to my comment via e-mail. You can also subscribe without commenting. Food lover, DIY-Her, and a Jill of all trades. I find fun in house projects and my kitchen. Food is fun, Home is where my heart is, and I am so happy to have you here! You can read more about me here.